You are here: Home / Recipes / Cooking with Kids / Where does my food come from? And how to answer that! Where does my food come from? And how to answer that! 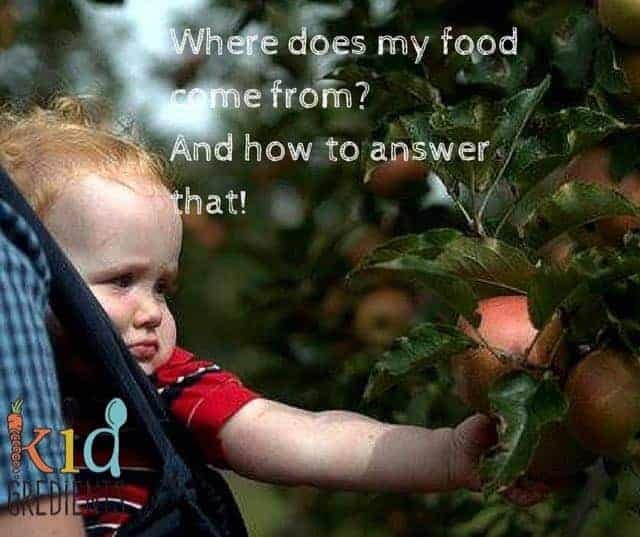 A long time ago I taught in a London primary school and we tackled the question: “Where does my food come from?”. The answers from the kids were astounding: peas came from a can, potatoes from a packet, meat from a tray…and I was shocked. We spent a whole half term investigating our food, what grew where, how it was grown, how it was processed etc. I felt by the end of it they had a much better understanding of food- we even grew our own and produced our own healthy feast. So I was ready for the day when it would be my job to educate my kids on the very same topic. My kids love food. They love helping to make it and most of the time they love eating it. My daughter loves getting her hands dirty to make everything from bread through to veal saltimbocca. I’ve tried very hard to ensure that my kids know where food comes from. My daughter has helped pop popcorn, helped to fill the dehydrator with pineapple for dried pineapple rings and she’ll happily tell you that flour is ground up wheat. I thought I would do all the ground work for you and teach you how to teach your kids where food comes from. I’ve just been made a Jamie Oliver Food Revolution Ambassador for my local area and I’m recently excited to get started on all the monthly challenges and things that come with it, including organising a community event for Food Revolution Day in 2016. It can be as simple as cress, chia or micro greens of some description. It can be done on a sunny windowsill on some cotton wool and as long as it can be eaten at the end, it will help them understand the process. Of course, if you have a lot of grass in the backyard, you could turn some of it into a veggie patch and get serious about growing. Some prolific growers are rocket, chillies, and herbs. nothing beats pulling carrots out of the ground though, or digging for potatoes, both of which you could even grow in a pot. We have apple trees, manadrin trees, lemon trees, nectarines, blueberries, oranges, peaches and limes…all grown in pots! Even if we get one apple a season the experience of growing them is worth it. If you’re growing herbs, let the kids make their own marinades, experimenting with flavour combinations. They will come up with some great ideas (not all edible, but great all the same). 2. Go to a growers/farmers market. Get the kids chatting to the growers, find out what is in season and how to use it. Choose your apples from a wooden crate, taste things before you buy them and aim to buy something new everytime so you can try it. By the way, it might sound silly but a cute smiling kid who is interested in food at a farmers market will never go hungry. In fact if the growers are like any I’ve met, a few extra apples slip into the bag after weighing and there’s often an extra “roadie” mandarin. 3. Go and pick fruit. We have done a few picking outings and the different farms are all located on sydney’s fringe. There is the Apple Shack at Helensburgh/Otford, Cedar Creek Orchard at Picton, Hawkesbury Harvest at Dural and there are a few that do it at Bilpin. The experience of fruit picking isn’t just about grabbing some fruit to bring home, it shows the kiddies how long it takes to collect the fruit and how careful you have to be, so as to not damage the plant. Effectively it is teaching them to respect food. 4. Buy the base product. What? So, instead of buying bread, buy yeast, flour, salt and make your own. It teaches your kids an awful lot about the work that goes into making the food they eat. Buy peas and shell them, buy eggs and flour and make pasta. I’m not saying this has to happen at every meal, but at least often enough that they are reminded of how food is made. By shopping from bins in a bulk buy store, kids learn to recognise the actual foods rather than the brands, there are more and more stores doing this, Honest to Goodness is one in Sydney and there is The Source Bulk Foods which has lots of locations. If you’re lucky they will even have a machine for making your own peanut/almond/cashew butter. It’s great fun to do! 5. Show them food labels. Map the actual places your food comes from, perhaps the pasta is from Italy, the soy sauce from Japan, the oreos from the US. Show them how far their food is travelling. See if you can identify all the ingredients, pull them out of the cupboard and look at them all. Get the kids imagining the process they undergo. Hopefully these ideas will give you some new ways to answer the question for you. Get them involved! Great ideas! We LOVE the farmers market 🙂 Thanks for linking up on #ToddlerFunFriday! Another great post! It’s such an important topic. 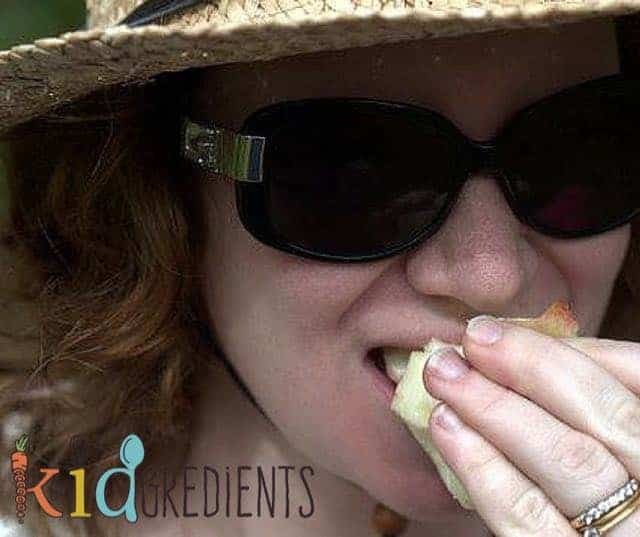 I’ve taught in schools too and have found that kids love eating food they’ve grown or cooked themselves (even the really picky kids!). I love the idea about the food labels.